Take football but add odd-shaped balls that you can pick up and you end up with rugby - the sport of gentlemen. Here are ten facts about Rugby. The sport of rugby is named after Rugby School, where the game was first played. The game is said to have been invented in 1823 when William Webb Ellis caught the ball while playing a game of football* at school, and ran to the goal with it. Although there is doubt about whether this actually happened, Webb Ellis is still remembered as the sport's inventor and the winner of the Rugby Union World Cup, held every four years, receives the Webb Ellis Cup. * At the time, the game of football played in schools wasn't the sport that it is now, with each school having their own rules. It was only from the middle of the 19th Century when inter-school matches began to take place that set rules were defined, with the two main variants of football becoming Association Football (soccer if you're American) and Rugby Football. 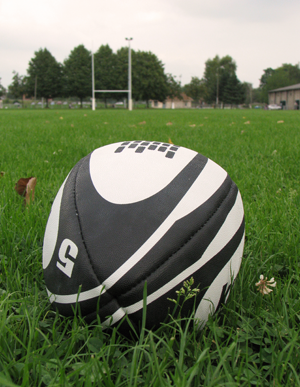 Rugby is known for the use of oval-shaped balls. However, this hasn't always been the case. Initially, the balls were plum-shaped due to the shape of pigs' bladders that they were made from. They became more spherical towards the end of the 19th Century when they began being made using rubber inner tubes rather than the bladders of pigs. However, to distinguish the balls used in rugby from the balls used for football, Rugby School requested that their balls remained slightly egg-shaped. Over time, they have become more and more flattened to the shape that they are now. Oval balls are more suited to rugby than spherical balls as they are easier to catch, hold and run with and don't roll as far so don't go out of play as often. As rugby balls and footballs were made from pigs' bladders and they had to be blown up by breath alone, it was possible to become ill if blowing up a diseased bladder, and the wife of Richard Lindon, a man who made balls for Rugby School in the 19th Century, died after breathing in the air from too many bad bladders. The reigning Rugby Olympic champion is that famous (?) rugby-playing nation, the United States! The game of rugby has only has only been an Olympic sport four times and made its first and last Olympic Games appearances in Paris. The first time it was played was in 1900 during the Paris Olympics. It was played again in the London Olympics of 1908, next in the 1920 Antwerp Olympics and finally in the 1924 Paris Olympics. As well as being the current Olympic champion, the United States is also the most successful nation winning gold in both the 1920 and 1924 Olympic Games. A seven-a-side version of Rugby made an appearance in the 2016 Rio de Janeiro Olympics. The first time a national anthem was sung before a sporting event happened, kind of spontaneously, before a rugby game. New Zealand famously dance the Haka before the start of a game of rugby, a traditional war-dance which is sometimes seen as an attempt to intimidate their opposition. On 16th November 1905 they played Wales at Cardiff Arms Park. After New Zealand danced the Haka before the match, Wales responded by beginning to sing the Welsh national anthem, ‘Hen Wlad Fy Nhadau’ (not sure what it means, but it probably isn't anything to do with chickens). The crowd picked up on this and joined in. Nowadays, before major sporting events, it is traditional for the national anthems of the countries being represented to be sung beforehand. Rugby Union World Cup tournaments are held every four years. The first tournament took place in 1987. It was hosted by Australia and New Zealand and was won by New Zealand. The United Kingdom and Ireland hosted the 1991 tournament which was won by Australia. South Africa were hosts in 1995 and also won the tournament. Wales hosted the tournament in 1999 when Australia were victorious. Australia hosted the 2003 tournament which England won and France hosted the 2007 which South Africa won. New Zealand were hosts for the 2011 World Cup, which they also won. They also won the 2015 World Cup which was held in England and Wales. Rugby players mostly earn points by scoring tries, achieved by a player crossing the touchline with a ball and touching it to the ground (which can be done by falling on it!). A try in rugby union is worth 5 points, in rugby league it is worth 4. However, a try was once worth nothing, instead it gave the player who achieved one the opportunity to "try" to score a goal, hence its name. Goals were scored by placing the ball on the ground and kicking it over the crossbar and between the two posts, therefore converting the try into a goal, a goal being worth 1 point. Nowadays, an attempt at a conversion still follows a successful try and gives players the opportunity to score an extra 2 points. The Rugby World Cup game with the highest number of points was 162 from the match played on 4th June 1995 when New Zealand beat Japan 145 points to 17. The same whistle is used to kick off the opening game of every Rugby World Cup tournament. It is the Gil Evans whistle and was first blown by Gil Evans, the Welsh referee overseeing a match between England and New Zealand in 1905. It was also used at the kick off of the final rugby match at the 1924 Paris Olympics. The first international rugby match took place between Scotland and England in 1871 at Raeburn Park in Edinburgh. Scotland won 1-0 by converting a try. The scorer, and therefore the first player to score an international rugby goal, was William Cross. If the modern scoring system was used, the score would have been 12-5 to Scotland, who scored two tries and one conversion. England achieved one try but failed to convert. The game happened 18 months before the first international Association Football (soccer) match, which took place in November 1872, also between Scotland and England.